Eurocool Falling Film Chillers are suitable for continuous chilling of Liquids close to their freezing point (ie water to 0,5 °C). 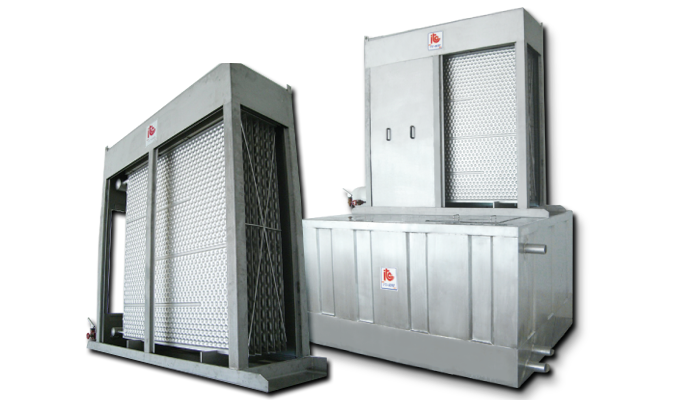 Also viscous Liquids, detergents, etc and polluted liquids not easily handled in large quantity by conventional heat exchangers can all be chilled with the Omega Falling Film Chiller. Required Cooling Capacity (kWr) at -3℃ Evap.Temp. Based on 32℃ inlet water temperature. Based on 1℃ outlet water temperature. When we look at it closely, an intriguing picture will emerge. We call this fantastic model “Package Falling Film Water Chillers by ITC”. This innovation is specialized technology which the top internal structure is built up of a film plate stainless steel. Along with the refrigerant usage, The “Waterfall” vertically flows down through the plate, and the cold water then resides in the water tank. Consequently, at the bottom part, a stainless steel water tank filled with pre-cooled water will now be ready for delivering to the pipeline connection. Moreover, its performance obviously confirms 32 ℃ water inlet and 1 ℃ cold water outlet. This machine is extensively used for food processing such as cleaning and washing products. Hence, we would like to offer you this phenomenal high quality water chiller that you will never regret.